This topic describes the components used to ensure high availability in Cloud Foundry, vertical and horizontal scaling, and the infrastructure required to support scaling component VMs for high availability. This section describes the system components needed to ensure high availability. During product updates and platform upgrades, the VMs in a deployment restart in succession, rendering them temporarily unavailable. During outages, VMs go down in a less orderly way. Spreading components across Availability Zones (AZs) and scaling them to a sufficient level of redundancy maintains high availability during both upgrades and outages and can ensure zero downtime. Deploying Cloud Foundry across three or more AZs and assigning multiple component instances to different AZ locations lets a deployment operate uninterrupted when entire AZs become unavailable. Cloud Foundry maintains its availability as long as a majority of the AZs remain accessible. For example, a three-AZ deployment stays up when one entire AZ goes down, and a five-AZ deployment can withstand an outage of up to two AZs with no impact on uptime. If you are deploying in lab and test environments, the use-haproxy.yml ops file enables HAProxy for your foundation. For more information, see Using Your Own Load Balancer. For storing blobs, large binary files, the best approach for high availability is to use external storage such as Amazon S3 or an S3-compatible service. If you store blobs internally using WebDAV or NFS, these components run as single instances and you cannot scale them. For these deployments, use the high availability features of your IaaS to immediately recover your WebDAV or NFS server VM if it fails. Contact Pivotal Support if you need assistance. The singleton compilation components do not affect platform availability. You can scale platform capacity vertically by adding memory and disk, or horizontally by adding more VMs running instances of Cloud Foundry components. The nature of the applications you host on Cloud Foundry should determine whether you should scale vertically or horizontally. For more information about scaling applications and maintaining app uptime, see Scaling an Application Using cf scale and Using Blue-Green Deployment to Reduce Downtime and Risk. 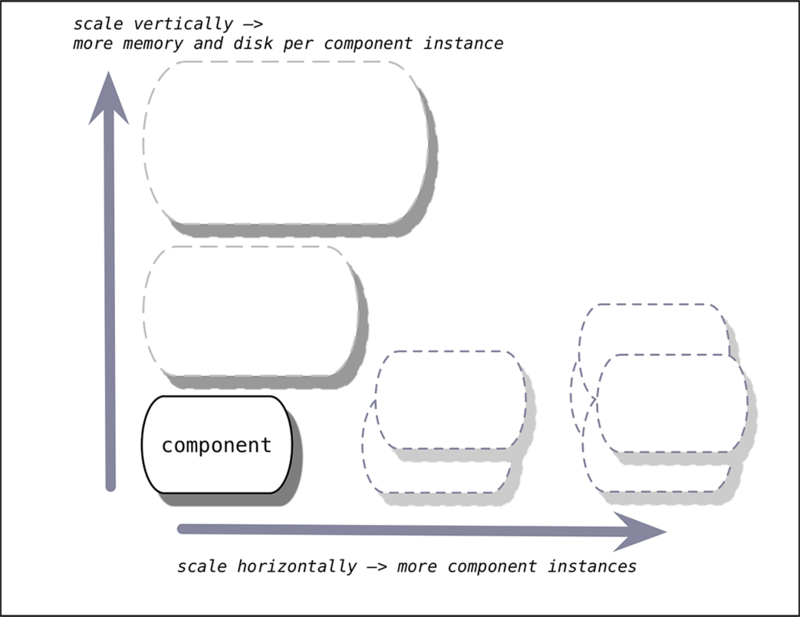 Scaling vertically means adding memory and disk to your component VMs. Free space on host Diego cell VMs so that apps expected to deploy can successfully be staged and run. Disk space and memory in your deployment such that if one host VM is down, all instances of apps can be placed on the remaining Host VMs. Free space to handle one AZ going down if deploying in multiple AZs. Scaling horizontally means increasing the number of VM instances dedicated to running a functional component of the system. You can horizontally scale most Cloud Foundry components to multiple instances to achieve the redundancy required for high availability. You should also distribute the instances of multiply-scaled components across different AZs to minimize downtime during ongoing operation, product updates, and platform upgrades. If you use more than three AZs, ensure that you use an odd number of AZs. For more information regarding zero downtime deployment, see Scaling Instances in PAS. Diego Cell ≥ 3 1 The optimal balance between CPU/memory sizing and instance count depends on the performance characteristics of the apps that run on Diego cells. Scaling vertically with larger Diego cells makes for larger points of failure, and more apps go down when a cell fails. On the other hand, scaling horizontally decreases the speed at which the system rebalances apps. Rebalancing 100 cells takes longer and demands more processing overhead than rebalancing 20 cells. Consul ≥ 3 1 Set this to an odd number equal to or one greater than the number of AZs you have, in order to maintain quorum. Distribute the instances evenly across the AZs, at least one instance per AZ. MySQL Internal Load Balancer 1 0 A load balancer distributes SQL traffic across two redundant MySQL proxies. HAProxy 0 or ≥ 2 0 or 1 For environments that require high availability, you can scale HAProxy to 0 and then configure a high-availability load balancer (LB) to point directly to each Gorouter instance. Alternately, you can also configure the high availability LB to point to HAProxy instance scaled at ≥ 2. Either way, an LB is required to host Cloud Foundry domains at a single IP address. Loggregator Trafficcontroller ≥ 2 1 Deploying additional Loggregator Traffic Controllers allows you to direct traffic to them in a round-robin manner. For a high availability deployment, Pivotal recommends at least two per Availability Zone. This section describes the surrounding infrastructure required to support scaling component VMs for high availability. The BOSH Resurrector continuously monitors the status of all virtual machines in an PAS deployment. The Resurrector also monitors the BOSH Agent on each VM. If either the VM or the BOSH Agent fail, the Resurrector recreates the virtual machine on another active host. To enable the BOSH Resurrector, see Enable BOSH Resurrector. To configure your resource pools according to the requirements of your deployment, see the Ops Manager configuration topic for your IaaS. Each IaaS has different ways of limiting resource consumption for scaling VMs. Consult with your IaaS administrator to ensure additional VMs and related resources, like IPs and storage, will be available when scaling. For information about configuring resource pools for Amazon Web Services, see Amazon EC2 FAQs in the Amazon documentation. For information about configuring resource pools for OpenStack, see Manage projects and users in the OpenStack documentation. For information about configuring resource pools for vSphere, see Configuring BOSH Director on vSphere. For database services deployed outside Cloud Foundry, plan to leverage your infrastructure’s high availability features and to configure backup and restore where possible. For more information about scaling internal database components, see the Scaling Instances in PAS topic. Note: Data services may have single points of failure depending on their configuration. Contact Pivotal Support if you need assistance.